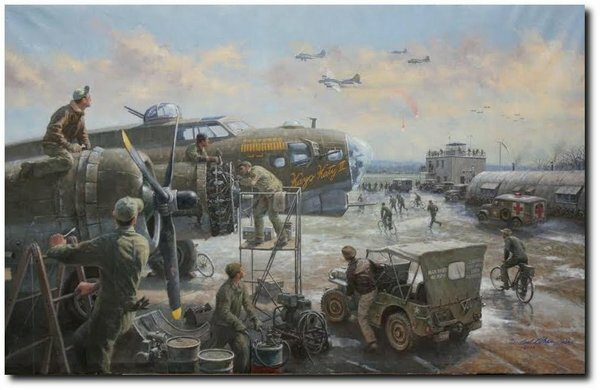 We are at an Eighth Air Force base somewhere in England, it is late Autumn 1944. After a dreary day of rain, the clouds break and the atmosphere is suddenly bathed in sunlight. In the foreground mechanics are performing maintenance work on the B-17, Kayo Katy II , when in the distance, the sound can be heard of a multitude of Wasp Cyclone engines. The mechanics momentarily cease their tasks and look up. Overhead, Fortresses are returning home from a brutal mission, bombing industrial targets in Nazi Germany. The immediate thoughts of the ground crew are: ‘How many of our guys made it back?’ They start counting planes. 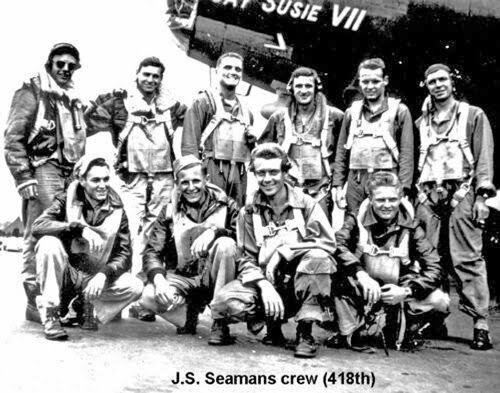 ‘There’s a Pathfinder ship – she’s in trouble and dropping flares – wounded aboard!’ A similar scenario is played out on so many air bases in England during the four long years of war.